Why am I getting negative output impedance using the following test circuit ? There may be other faults, but you have two AC sources activated simultaneously, VSIG and IOUT. This way you don't measure output impedance. I think this depends on the direction of i(Vss), which probably is negative. BTW: i(Vss) probably contains all currents into VSS, i.e. also those of the pre-stages. ... and care for the correct output condition (usually short circuit). Use a very small resistor (like your Rf) connected from output to VSS via a huge capacitor. two AC sources activated simultaneously, VSIG and IOUT. See the resulting frequency response when I short the CMOS inverter input to ground, literally means that I only have one AC source in the test circuit. Shorting input to ground is neither correct, you want DC bias but no AC source. Why I(Vss)? If you send 1 A to the output, the output impedance is equal to V(out). you want DC bias but no AC source. Anyone have comment about the following simulation result ? I am going to double check against manual maths calculation ? Don't agree. It makes particularly sense if you want to guarantee that the circuit is biased in active range (both transistors in saturation) without tuning a DC voltage. But my point was different. You must not place a second AC source along with the bias circuit. Your latest post clarifies that you still have. Whatever the latest plot shows, it can't be output impedance. saturation region, at once, because the gates are co-driven. which makes Zo have a parallel gain, Zin dependent term. So you want to represent the gate drive reasonably. does not extend to "real RF". and use that voltage for the gate of the second as well. output go to VDD/2 as well. You must not place a second AC source along with the bias circuit. Could you justify why ? Both sources are acting simultaneously, the output voltage you are measuring is caused by the superposition of both, but you want to see only the effect of injected output current. That's just elementary electrical network theory, I believe. Last edited by promach; 6th July 2018 at 15:18. Do you see the bold text "(valid in the saturation region)"? devices -will not- be in saturation under any condition? ... as FvM told you in post #5 . The following is my updated test circuit. However, using your advice give me lower output impedance, about 8 kilo ohms lower compared to theoretical calculation. I am still very doubtful about the correctness of test circuit setup for output impedance measurement. The test circuit should basically work. Rf may be a way too high if the MOSFETs show leakage current. 1e9 should be more than suffcient. Check the bias point! 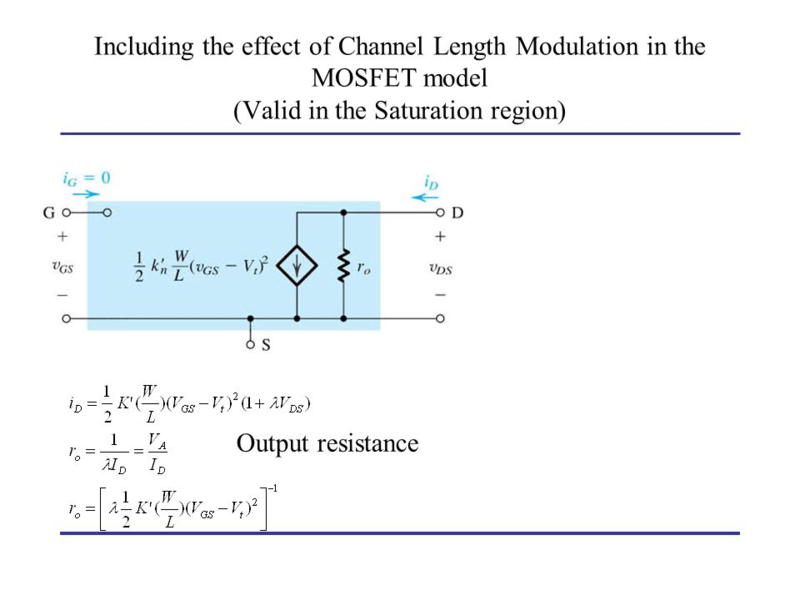 Rf may be a way too high if the MOSFETs show leakage current. This is a self-bias CMOS inverter. Could you advise ? ... using your advice give me lower output impedance, about 8 kilo ohms lower compared to theoretical calculation. ... generates a (nearly) full feedback amplifier, i.e. gain≈1 for low frequencies (LF), with corresponding low LF output impedance. Did you consider this? ... generates a (nearly) full feedback amplifier, i.e. gain≈1 for low frequencies (LF), with corresponding low LF output impedance. Not in the frequency range of interest with 1F filter capacitor! You didn't tell before how much the expected value is. 20% deviation sounds realistic. Means check the bias resistor voltage drop. Apparently it's acceptable. That's it.